Studio: Hägerstensvägen 145. 126 48 Hägersten, Sweden. Rut-Malin Barklund (born 1974) gained her knowledge at several different schools in Sweden; Metal craft at Nyckelviksskolan and Stenebyskolan, and finally a bachelor's degree from Ädellab, Konstfack University College of Arts, Craft and Design. Rut-Malin's work displays an artistic inquiry, where familiar everyday materials are being processed and appear in a new form. Her jewellery addresses the issue of the traditional jewellery tangible value, and stretches between scenes for crafts and fashion. 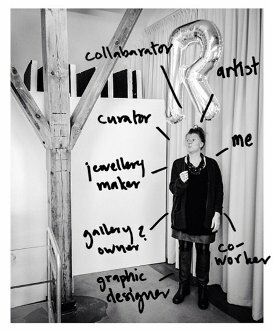 The Swedish Arts Grants Committee gave her a one-year working grant 2009, and a grant for costly projects 2011. Studying graphic design at high school and working in that field for a good 8 years before deciding on switching to art/craft school studies for 6 years seems to have been an excellent set up for Rut-Malin Barklund. This combination of educations and creative work has given her a self-reliance, knowledge and courage to put her hands on all sorts of projects. Today she is working as a jewellery maker and exhibition producer, in combination with graphic design commissions. Recent years she has been involved in several collaborations, for example ALLA and Not So Precious. Initiating and developing projects like this have now resulted in the development of an own exhibition space, BARKLUND & Co, she calls it a hub for the arts of craft. 2004-2007 Konstfack, Sweden. Ädellab - Silversmithing and jewellery. Bachelor of Fine Arts. 2003-2004 Stenebyskolan, Sweden. Forging and Metalwork. 2002-2003 Nyckelviksskolan, Sweden. Metal Design And Craft. 2001-2002 Konstskolan i Stockholm, Sweden. Basic Art Studies. 1990-1993 Tumba High School, Sweden. Graphic Design. 2013-2014 Archaeology A, Södertörn University, Sweden. Investigation of Chains. Four Gallery. Gothenburg, Sweden. Not So Precious. Cooperation project with A Larsson and S Borgegård. Showroom, Stockholm. S Borgegård. UNIART, Gothenburg, Sweden. Contemporary Swedish Art Jewellery. Galleri Anna H, Gothenburg, Sweden. Contemporary Swedish Art Jewellery. Platina. Stockholm, Sweden. Unexpected Pleasures: the art and design of contemporary jewellery. Design Museum. London UK. Love of Place. National Museum of Scotland. Edinburgh, U.K. The State Of Things. Pinakothek der Moderne. Munich, Germany. The Wood Show. Flow Gallery. London, UK. Mycket snack och mycket verkstad. By KHVC, Krapperups Konsthall. Sweden. Frame. By Gallery Platina. Munich, Germany. For long and faithful duty – 10 years of beauty. Platina. Stockholm, Sweden. Op voorraad. Inside Design. Amsterdam, Netherlands. Schmuck. RMIT Gallery. Melbourne, Australia. There is no place like home. Platina. Stockholm, Sweden. Nano. Studio 44. Stockholm, Sweden. Schmuck. Birmingham City University U.K.
Brainfood. Gustavsbergs Konsthall. Stockholm, Sweden. 217 days later. ShowKonstfack. Stockholm. Sweden. BA Graduation Show. Konstfack. Stockholm, Sweden. Touch Down. Konstfack. Stockholm, Sweden. ALLA. Is it possible to question prejudice and xenophobia with jewellery? Initiated (2010) and produced by Rut-Malin Barklund and Hanna Hedman. Involving 29 contributing artists, two photographers, a graphic designer and a writer. Travelling exhibition on train through Sweden, 25-27 October 2011. A documentary photographer followed the travelling exhibition. A film (20 min) and a projection (5 min) was made and shown together with the artists’ work on following five exhibitions. Röhsska Museum 2 Oct–9 Dec 2012. Form/Design Center Malmö 14 dec 2012–13 jan 2013. Gustavsbergs Konsthall 1 feb- 3 mar 2013. Eskilstuna Konstmuseum. 30 August - 28 September 2014. Gallery Medium, Academy of Fine Arts and Design in Bratislava. 9-10 October 2014. ALLA ft Daniela Hedman – Please sign here. A development of the project with one of the participants’ individual works as a starting-point. Shown as an interactive exhibition in Munich 10-15 Mars 2015, as a part of Re-Public Jewellery. 2015 Konstfack, University College of Arts, Crafts and Design. Stockholm, Sweden. 2015 HDK, School of Design and Crafts. Gothenburg, Sweden. 2014 Sperk Stret Jewellery Conference, Academy of Fine Arts and Design in Bratislava, Slovakia. 2012 HDK, School of Design and Crafts. Gothenburg, Sweden. 2011 Uppsala Art Museum. Uppsala, Sweden. 2012 Röhsska Museum. Gothenburg, Sweden. 2013 Contemporary Swedish Art Jewellery. 2007 Graduation Show Konstfack catalogue. 2012 ALLA. Project publication/Exhibition catalog. Die Nueue Sammlung (Danner Foundation)Pinakothek der Moderne, Munich, Germany. 2014 Iaspis. Swedish Art Grants Committee’s International Programme. 2012 Iaspis. Swedish Art Grants Committee’s International Programme. 2011 Iaspis. Swedish Art Grants Committee’s International Programme. 2011 Swedish Art Grants Committee, Project support. 2006 Fabrikör JL Eklunds Hantverksstiftelse.